Japanese carrier NTT Docomo has announced the Sony Z1F, It has a 4.3 inch(720p) Triluminos Display with X-Reality engine and a resolution of 1280 x 720 pixels, the device is powered by 2.2 GHz quad-core Snapdragon 800 processor and runs on Android 4.2 Jelly Bean. The Sony Z1 F has the same 20.7 MP rear camera along with Sony’s G lens and a 27 mm wide angle f/2.0 aperture custom 1/2.3 Sony Exmor RS image sensor, BIONZ image processing engine. The device does full HD recording at 1080p and has a 2 MP front camera. The Z1 F can be considered as the mini version of the Sony’s flagship Z1, but if you consider other same smartphones like the HTC One mini and the Samsung galaxy S4 mini, all these phones have been compromised when it comes to hardware. But, in this case this device has the same of the features that his brig brother introduced to the market, like the phone itself being waterproof, same camera, same processor and alot more. The device weighs 140 grams. 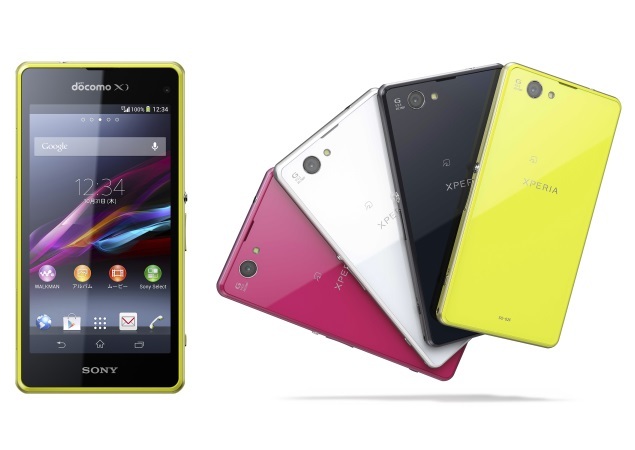 The Sony Xperia Z1 is available in Lime, Black, White and Pink. colors. It would be available from NTT Docomo from late December 2013. No word on pricing and availability in India yet. But the upcoming nexus phone might kill the the purpose of buying this phone (If it is priced similar to nexus 4). Wow! Thats something now! Sony is full of surprises! they fail us only with the display! hope they rectify it!